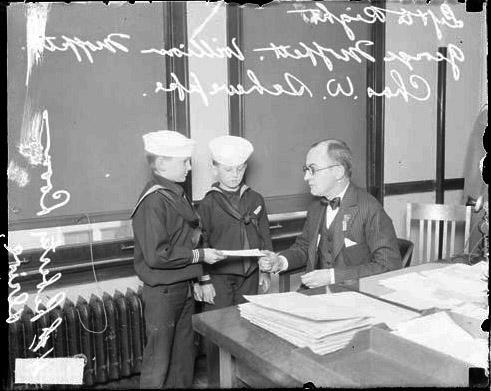 Title [Charles H. Schweppe, broker, sitting behind desk with George and William Moffett wearing sailor uniforms] [graphic]. Collection summary Image of Charles H. Schweppe, broker, sitting behind a desk in an office in Chicago, Illinois, receiving a piece of paper from George and William Moffett during the 4th Liberty Loan drive. The boys, who are wearing sailor uniforms, are the sons of Captain William Adger Moffett.